The domestic oil and gas supply picture is better than it’s been in a generation, and it’s getting better every day. That’s not my opinion; it’s also the conclusion of Adam Sieminski, chief administrator of the Department of Energy’s Energy Information Administration (EIA), the government’s one-stop shop for all statistics related to our nation’s energy production and consumption. Sieminski was interviewed by Platt’s Energy Week upon the release of EIA’s annual reserve statistics on August 2, 2012 (link to Platt’s video, approx. 10 minutes). According to the latest available reserve estimates (Year End 2010), domestic reserves of liquid petroleum stand at a 21-year high: 25 billion barrels. During the last year of reporting, oil reserves grew by 13%; within two years, according to Sieminski, reserves might be equal 1980’s level. Note that the time frame of the report is nearly two years ago. Since drilling activity continues unabated, it’s entirely plausible that we may already be at the 30 billion barrels level. If true, that will represent an unprecedented growth of nearly 50% in five short years. Not only are we replacing increasing levels of production, our ready inventory is growing. The new numbers include not just oil but natural gas condensate as well. Gas condensate is a light oil-like by-product of natural gas production. For some reason, EIA began tracking oil and condensate only recently. The crude oil history is here. If the oil picture seems rosy, the natural gas story is even better. Gas reserves are already (YE 2010) the highest in history at 300 trillion cubic feet, having increased for twelve straight years. The gas production rate, expected to average 69 billion cubic feet per day in 2012, is also the highest ever. So much for “Peak Gas”. The abundant supply of gas has driven prices to historic lows relative to oil. Even hard-core environmentalists are beginning to concede the advantages of clean, abundant, domestic gas as an alternative to coal (as an electricity-generating fuel) and oil (as a transportation fuel). In fact, gas recently surpassed coal as the #1 fuel for electricity. We currently consume about 28 trillion cubic feet (TCF) per year of natural gas, importing about 4 TCF/yr, mostly from Canada. In the interview, Sieminski forecasts that by 2022 the U.S. will be a net exporter of gas. Q: One issue that always comes up, and it’s a political one, is who does take credit for these sorts of increases, the government or the industry? Of course, Republicans and Democrats will argue that it’s one party or another, but how should credit be assigned for this sort of surge? SIEMINSKI: Well, I think realistically it’s the companies themselves in terms of where they’ve been operating, and the capital that they’ve invested, the people and technology that they’ve been able to bring to the task. Now, in terms of the land, one of the things EIA was able to do was to look at where the oil and gas shale formations are; for the most part they are not coincident with federal landholding so it’s hard for the federal government to actually show big either oil or gas shale production numbers on its own land simply because the geology favors private and state landholdings. In terms of which political party really deserves the credit, as you know EIA does not make policy judgments, but oil investments are a very long term process, and I would say that everybody that has been working on these things for the past ten years gets some credit for it. “We are an energy-rich nation. We have more oil and natural gas than anyone thought possible even 5 years ago: more potential energy than many oil-exporting nations in the Mideast, and more than most countries in the world. Emphasis added. Hear, hear. – Ed. 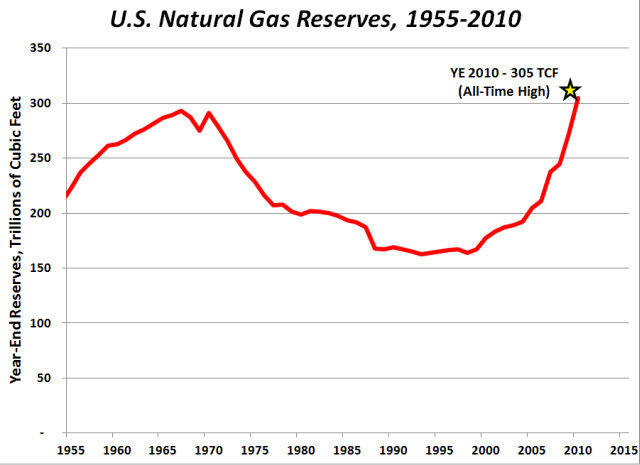 * – “Reserves” are a petroleum engineering term of art. “Resources” is the more all-encompassing term. Reserves are like the cash in your checking account; resources are like your total assets. Reserves are a small, highly certain subset of total resources. People who carelessly use the terms interchangeably (like our current President) inevitably conclude that we’re going to “run out” of reserves in 10-15 years if we keep consuming at today’s rate. Fact is, the reserve number has always been 10 to 15 years’ worth of production. 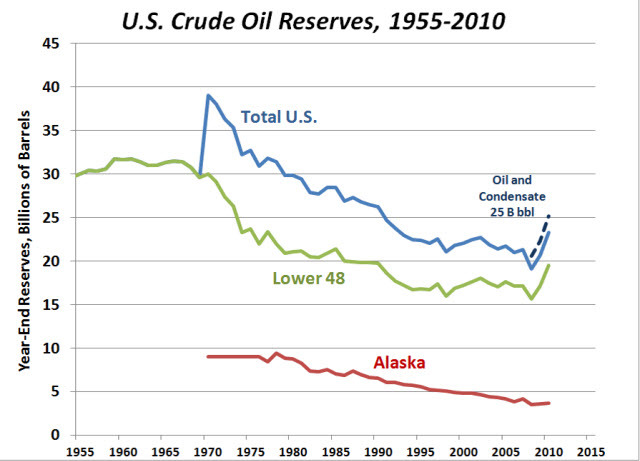 Technology, economics and policy determine how readily resources can be turned into reserves. This entry was posted in Energy, Peak Oil and tagged Adam Sieminski, EIA, Energy policy, Natural Gas, Oil Reserves, Peak Oil. Bookmark the permalink.